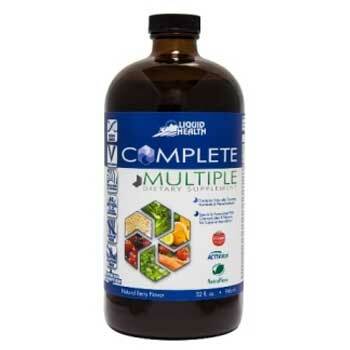 Liquid Health’s Complete Multiple is their first all-inclusive daily liquid multivitamin. It has been reformulated to maintain its place at the forefront of liquid nutrition. Now completely soy free. Vitamin E from sunflower oil. Increased amount of super phyto-food complex contains 10 Vegetables, 29 fruit extracts or concentrates, 12 spices and herbal extracts, 3 sea vegetables and ACTIValoe® aloe vera juice for a superior ORAC antioxidant and polyphenol content.